Extremely thin-walled tubes result in excellent thermo-transfer for better and more reliable PCRs. The tubes are of high transparency and produced with a special poly propylene-type in order to avoid condensation in the upper part of the tubes. Optimally suitable for the handling with a 8-channel pipette. The 8-Microstrips are offered separately both with attaching caps and without (8-Microstrip classic). Likewise available are also combination luggages with 8-tube-strips and 8-cap-strips. 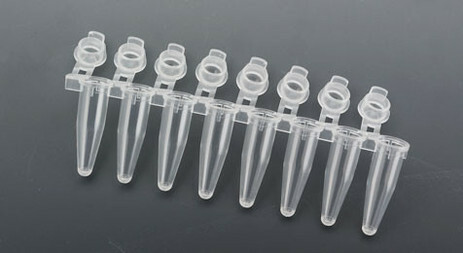 Also in the assortment, the 8-strips "low profile" for small sample volumes (< 20 µl). Compatible to all standard 96-well thermocyclers. Are you interested in a sample? Please send an email to info@biovendis.de.